Dr. William Kolbrener’s Lehrhaus essay Killing Off the Rav (So He May Live) employs attention-grabbing, sensationalist metaphor to argue that third-party depictions of Rav Yosef Ber Soloveitchik zt”l must be ignored in order for contemporary Jews to access the firsthand teachings of the authentic Rav Soloveitchik and properly benefit from the real article, so to say. In this new volume, Kolbrener paints Soloveitchik as an irreconcilably torn personality and as a complex pluralist. Soloveitchik writings, in this reading, become texts of pluralism, creativity, modernity, and self-creation, instead of the more popular presentation of his writings as geometric, analytic, and halakhic. Kolbrener admits that his method as a literary critic, allows him to interpret freely outside of Soloveitchik’s original meaning and context. He is certainly not attempting a conventional archival based biography or interviews. Hence, Soloveitchik, using critical theory, becomes a window on contemporary pluralism, gender studies, and psychoanalysis, not the more often used Centrist Orthodox lens of mesorah, submission, and anti-feminism. 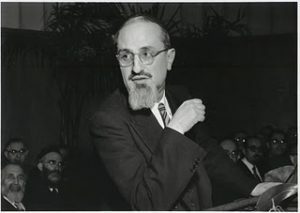 So Joseph Soloveitchik, like Milton, is one of the figures in intellectual history whose critics have broken down into opposing “opposing camps,” with each, as Lawrence Kaplan, the translator of Halakhic Man writes, “dismissing those features stressed by the other as secondary.” In a recent version of this internecine warfare, Nathan Cardozo, though touting the “brilliance” of Soloveitchik, finds him in the end to be “an old-fashioned Rosh Yeshiva,” “highly conservative,” who made “no practical breakthroughs in halakha.” If only, Cardozo suggests, Soloveitchik had been more like the more radical and innovative Eliezer Berkovits, or even Emanuel Rackman, Modern Orthodoxy would have truly had an advocate for the twenty-first century. … What some will certainly find a discomforting conclusion follows: in order for Soloveitchik’s reputation to live for us today, he first has to be ‘‘killed off.” Soloveitchik understood the principle informing this himself, realizing that he could only become himself—in what he saw to be the ultimate hiddush or creative act, self-creation—by metaphorically killing off his own fathers, the ‘halakhic men’ whom he both revered and against whom he rebelled. For Soloveitchik to become urgent again (as he should be), we must move past the conversation—or polemical disputes—between proponents or opponents of different versions of “Soloveitchik,” and re-read him with both critical and open minds. This will mean adopting the methodological pluralism that Soloveitchik himself advocated in Halakhic Mind in his approach to “religious philosophy”—his commitment to “thick description” and a variety of different interpretive perspectives. We may read Soloveitchik now with reverence or critique—or both—but we should move past the tired oppositions of previous critical approaches and recognize different modes of reading, so that Soloveitchik can speak to us, as he should, in the twenty-first century. It may come as a shock, but upon a close reading of Rabbi Cardozo’s article and my response, it clearly emerges that we do not argue about whom the Rav was. Our argument is about whom the Rav should have been. 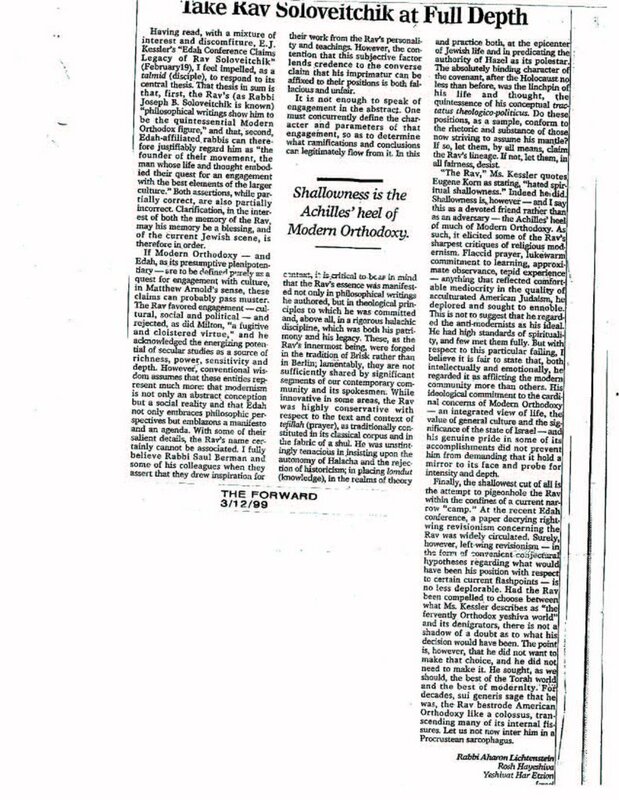 While Rabbi Cardozo laments the Rav’s refusal to permit Kohanim to marry divorcees, to engage Biblical Criticism and to create a progressive halachic system – for the Rav should have made his mark in these areas and thereby created a maverick legacy, argues Rabbi Cardozo – I passionately respect and appreciate the Rav’s orthodox positions on these matters. Rabbi Cardozo and I both agree on who the Rav was, so to say: a very complex and sophisticated traditionalist, who delved into and mastered modern thought but who held steadfast to the mesorah of his forebears as his core and essence , albeit often using very different language and applications which on the surface may seem to conflict with the older tradition. Rabbi Cardozo and I do not really present contradictory views of the Rav. The above disparity is to be noted in an introductory, parenthetical remark in Dr. Kolbrener’s essay: “… Soloveitchik, a major theologian of the late twentieth century (a distinction more important than that bestowed with the title ‘the Rav’)”. I must disagree. Rav Soloveitchik was a major theologian, but his primary lifework and focus were precisely denoted by “the Rav”. Furthermore, when dealing with master disseminators of Torah – rebbeim – one cannot sever their temporal existence and their writings from their eternal and living legacies. One must look to the closest disciples of a Torah disseminator to determine his focal impact and long-term emphases, and to understand the traditions, insights and attitudes he transmitted and exemplified. When dealing with Rav Soloveitchik, this means turning to his most accomplished students, who were intimately exposed to him, his ideas and teachings for extended periods of time, and who received from him a live and dynamic mesorah. When this indispensable and dispositive factor is considered, quite a different picture leaps forth – a picture of the doyen of halachic conceptualization, the ba’al ha-mesorah par excellence, and the eloquent spokesman for Torah in modern society. While methodological pluralism (as opposed to religious or faith pluralism) is a critical feature of the Rav’s thought, and it is an immensely beneficial approach to contemporary intellectual-theological confrontations, neither it nor various other ingenious and novel philosophical offerings of the Rav constitute his principal and focal contribution to contemporary Jewish life. Modern Orthodoxy is in crisis, and those on the edge have often been exposed to the Rav’s philosophy but were unfortunately not stirred. The legacy of the Rav will play out successfully among the firmly committed (and those sincerely open to firm commitment), very much including the batei medrash of the “yeshiva world”, where the Rav’s Torah is being increasingly sought after. (T)he Rav’s essence was manifested not only in philosophical writings he authored, but in theological principles to which he was committed and, above all, in a rigorous halachic discipline, which was both his patrimony and his legacy. These, as the Rav’s innermost being, were forged in the tradition of Brisk rather than in Berlin; lamentably they are not sufficiently shared by significant segments of our contemporary community and its spokesmen. While innovative in some areas, the Rav was highly conservative with respect to the text and context of tefillah as traditionally constituted in its classical corpus and in the fabric of a shul. He was unstintingly tenacious in insisting upon the autonomy of Halacha and the rejection of historicism; in placing lamdut, in the realms of theory and practice both, at the epicenter of Jewish life and in predicating the authority of Hazal as its polestar… Had the Rav been compelled to choose between what Ms. Kessler describes as “the fervently yeshiva world” and its denigrators, there is not a shadow of a doubt as to what his decision would have been. Who Are We Reaching Out To? Analyzing what is the ikar and the tafel of RYBS is an ongoing discussion that is difficult enough when such issues as what materials are part of the legacy as well as where RYBS primary accomplishments took place or imposing limitations such as only the materials published in RYBS lifetime which can be fairly described ad moving back the goalposts. Viewing the legacy of RYBS thru Dr Kolbrenners thesis is another way of looking at the legacy of RYBS without actually looking at the legacy itself. All information that one can learn about the Rav is worthwhile. However, there is no doubt what the Rav published in his lifetime is most authoritative. It is no secret the Rav edited draft after draft of that hat he published in his lifetime which he. Obviously did not do with the other great works eg Mipninei Harav, Toras Harav Foundations, Neoros Harav etc. We agree to disagree on this issue and we have been through this issue and its ramifications ad nauseum so I will merely state that our prior pisrings on this issue should suffice for this thread. i have written that secondary sources are helpful and writings based on shiurim are also. Are you disputing tha items written and edited by the Rav are entitled to the highest deference, higher than secondary sources which are themselves useful? No-just the notion that secondary sources are not entitled to any deference. i was listening to last Shabbat’s sermon by Rabbi E. Cosgrove while by the miracle of multi-tasking, this article was being read simultaneously. those who choose to listen might note the serendipity. Prof. Kolbrener’s quote of ‘the tragedy of the teacher who is too great for his disciples.’ struck me as the heart of the problem. i believe that less than a handful of individuals, may be seen as possible counter-examples, though each would probably see themselves as inadequate. in that role. Students for whom The Halakhic Mind or Ethical Man are as well understood as his Brisker Torah/innovations, are about to vanish from this earth. In their stead we have at one extreme those who mine the Rav ztl’s words for what can be construed as a comment on a contemporary situation half a century later. at the other extreme are those who fault him for not addressing what at his time had not yet crystallized as issues. both approaches are more convenient than simply stating that how he would have approached various contemporary issue is often / on occasion neither clear nor obvious nor definitive. Dr Bill’s last paragraph is IMO one of the most important to remember when discussing the Rav. When the Neeman Commission was being considered a couple of decades ago I asked a close talmid of the Ravs what he believed the Ravs position would have been. His response who knows. He the listed to me factors why the Rav would have been in favor of the commission and factors why the Rav would have been opposed. A cople of weeks later I showed the person an open letter to Rabbi Berman in the Jewish PRess by RAL who basically without claiming he was following the Rav gave a balanced pluses and minuses. I do not have a copy of that open letter, worth reading I its entirety . It is more balanced than Jewish Press description may imply. owning books and reading shiurim is necessary but far from sufficient. when the Rav ztl taught his aim was to transmit a derech halimmud in addition to actual yediot. it was the former where his uniqueness as a melamaid could often be found. his written shiurim, conforming to the methodology of brisk, almost always veered from that format, stressing only the latter. in any case, terms like ikkar and tafel are simplistic wrt the Rav ztl. he could insert an Aristotalien reference into a shiur with only those aware even noticing. one of my fondest recollection is the Rav asking a question, a dozen hands going up and then down, when he quickly added “and don’t tell me something stupid like….” What offends me are those who, as Mycroft observed, are sure what he would say on a particular complex issue. That statement is true of everything except for Torah. Shas scientific, medical advice is not true for all generations. Since the only way that the legacy of RYBS can be preserved is via what is available in print , on line and on tape, the Dor Asher Lo Yada Es Yosef should delve into anything and everything that has been disseminated as representing the legacy of RYBS, and to listen to what RYBS’s talmidm muvhakim have to say about what is his legacy. That is part and parcel of the process of the transmission of Torah from one generation to the next. Recollections about what transpired in shiur are wonderful, but for the next generation, they are tantamount to Sippurei Chasidim. Essentially agree- one can spend a lifetime reading what has been written about the Rav, read as much as possible by him and about him. People can get frustrated when their conventional categories don’t really fit someone else. They’ll accept that everyone is unique, but not take that to heart. Into that void of incomplete understanding, we often project our own thoughts. Who gets the final word? I wish you arichus yamim but final word will be decided after we have both reached 120. There ma be a different answer in Israel than in the US.